A landscape, whether established or recently constructed, is never complete. Healthy vegetation needs regular maintenance. Jeff's Landscaping & Yard Service is well-known and respected in the Tri-city area for providing commercial landscape maintenance that suits the needs of the customer and their property. Our experienced crew members are reliable. We provide quality work, and our prices are competitive. Jeff's Landscaping & Yard Service, L.L.C. is fully licensed and bonded in the state of Arizona. We offer scheduled maintenance programs as well as comprehensive property clean-ups. Our services include mowing, edging, weeding, trimming, blowing, raking, and debris removal. Fertilizing and weed control services are also available. We offer maintenance and repair of irrigation systems. The establishment and maintenance of erosion control is a service we can supply. During the winter months, we offer commercial snow removal. When landscaping requires updating, Jeff's Landscaping & Yard Service is happy to provide the design and services necessary for the project. Sodding, seeding, shrub and tree planting are available through our company. We construct retaining walls and outdoor living structures. We work with highly qualified sub-contractors when a design moves beyond our in-house expertise. Jeff's Landscaping & Yard Service serves a variety of commercial establishments in the Tri-cities area. Our maintenance bids include work for professional properties as well as home owner associations. We proudly treat all customers equally, whether the grounds are all-encompassing, such as that of a home owners association (HOA), or surround a small, downtown business office. 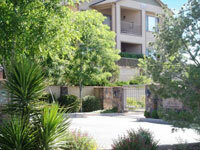 Are you searching for dependable commercial landscape maintenance? Tell us about your landscaping maintenance needs. Call Jeff's Landscaping & Yard Service toll-free at (877) 820-0863 or Request a Quote directly from our website.